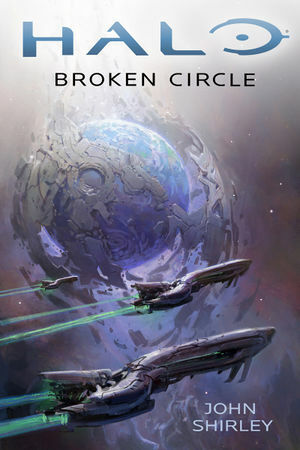 Halo: Broken Circle is a Covenant-focused Halo novel written by John Shirley. It was released on November 4, 2014. The first half of the book takes place during the Covenant's infancy in 851 BCE. The latter half takes place during the Great Schism and is told from the perspective of a new character, the Prophet of Clarity. An online excerpt of the novel's first chapter was released on the Simon & Schuster website on October 26, 2014. Later, an online excerpt of the novel's prologue was released on Gallery Books's Facebook on October 28, 2014. In a skirmish on the Planet of Blue and Red during the San'Shyuum-Sangheili War, High Lord Mken 'Scre'ah'ben commands San'Shyuum Reformist forces on the planet. San'Shyuum scientists desperately attempt to uncover Forerunner artifacts before Sangheili assault teams outnumber them. During the battle, Mken takes notice to Ussa 'Xellus, a Sangheili field commander. As the San'Shyuum are forced to attack the Sangheili through orbital bombardment with the Forerunner Dreadnought, Mken believes that he can use Ussa to create peace between the two species. Years later, shortly after the establishment of the Covenant during the Age of Reconciliation, three San'Shyuum—the Ministers of Relative Reconciliation and Kindly Subjection, and Mken who is now the Prophet of Inner Conviction and Minister of Relic Safety—meet in the Conference Deck of the Forerunner Dreadnought in the Chamber of Decision. They meet with the Sangheili Commissioners Viyo 'Griot and Loro 'Onkiyo. The five discuss an ongoing Sangheili rebellion that is now being led by Ussa 'Xellus. The Sangheili assure the San'Shyuum that they will eliminate the insurgency, but the Prophet of Inner Conviction remarks that even if 'Xellus and his clan are killed, the idea will live on to inspire others. Meanwhile, on the Sangheili mining colony of Creck, Ussa 'Xellus and his mate, Sooln, to recruit new members into their rebellion against the Covenant. When the two return to their vessel—Clan’s Blade—at a spaceport to leave the planet, they encounter 'Crecka. 'Crecka reveals that he wishes to join their rebellion. Despite Ussa's initial reluctance to work with the elderly Sangheili, 'Crecka claims that years ago he had discovered a Forerunner world containing advanced technology that would be useful in Ussa's attempt at overthrowing the San'Shyuum. Eventually, the three Sangheili depart Creck and set course for the shield world. The Sangheili arrive at the shield world and enter its interior, where they encounter the monitor of the installation, Enduring Bias. The monitor allows them to remain on the shield world, but demands to know their intents. Meanwhile, in the Nwari region located on Sanghelios' southern pole, the rest of the Xellus clan and its allies await Ussa's return. Tersa 'Gunok recalls 'Xellus warning the state of Xellus' residents to not trust the San'Shyuum. Shortly after, Covenant fighters attacked the state and forced Ussa to lead the survivors to Nwari. Ussa 'Xellus returns to their hideout and speaks with Ernicka the Scar-Maker. After identifying a Covenant spy within his group, Ussa and his allies leave Sanghelios for the shield world before the Covenant discovers them. Afterwards, the San'Shyuum and Commissioners reconvene to discuss Ussa's escape. Meanwhile, on the shield world, Ussa and Ernicka speak to Salus 'Crolon who questions the use of Forerunner artifacts, believing them to be a possible danger and an affront to the gods. As 'Crolon leaves, Ernicka expresses his fears that the Sangheili is treasonous. Back on High Charity, Qurlom informs Mken of a new Ministry created by the Hierarchs—the Ministry of Anticipatory Security. Qurlom tells Mken that the Ministry's Minister is R'Noh Custo, a political rival to Mken, and warns him that the Ministry was likely created by the High Prophet of Excellent Redolence to remove any individual that could present a threat to his title. Mken returns to his residence where he discovers that his spouse, Cresanda, is in a rare fertile cycle and the two mate. On the shield world, 'Crolon and Tersa are working while 'Crolon expresses his doubts of Ussa. However, Tersa insists that they cannot return to Sanghelios and must stay committed to living on the shield world. 'Crolon attempts to continue to convince Tersa that Ussa may be misguided, but stops when Ernicka orders them back to work. While in his office on High Charity, Mken receives a transmission from R'Noh, the new Minister of Anticipatory Security. The Minister reveals that he is aware of Cresanda's pregnancy and threatens to use his new-found influence to place Mken on the Roll of Celibates if he does not lead a mission to Janjur Qom, the San'Shyuum homeworld, ordered by the Prophet of Excellent Redolence to retrieve San'Shyuum females that are willing to mate on High Charity and an alleged Luminary stated to be on the planet. However, Mken is not willing to go on the mission and schedules a meeting with the rest of the Hierarchs, hoping that the other two would persuade the Prophet of Excellent Redolence against the mission or choose another San'Shyuum to lead the mission. But only the Prophet of Excellent Redolence and R'Noh are present. After Excellent Redolence threatens to place Mken on the Roll of Celibates, with implied execution, Mken reluctantly accepts to lead the mission. On the shield world, Enduring Bias tells Sooln that the world has the capability to break itself apart and have its disparate parts still habitable, as a fail-safe setting and known as the "Disassembler" process. Sooln speaks to Ussa about this discovery and Enduring Bias confirms that while it is true, he is unsure of how reliable the fail-safe is. On High Charity, Mken prepares to leave for Janjur Qom aboard Vengeful Vitality‎, a stealth corvette. Other members of Mken's mission include the San'Shyuum Captain Vervum L'kosur, communications officer S'Prog, and weapons officer Mleer, the Sangheili Rangers Trok 'Tanghil, Vil 'Kthamee, Ziln 'Klel, and Loquen 'Nvong, and the Huragok Floats Near Ceiling. Upon arriving in the Janjur Qom system, Vervum begins to monitor the transmissions of the San'Shyuum Stoics on the planet and discovers that their technology is much more simple than the Covenant's. As a dropship carrying Mken, Vervum, Mleer, Trok, Vil, Loquen, Ziln, and Floats Near Ceiling heads towards the planet's surface, Mken decides that Vervum is very likely an agent for the Ministry of Anticipatory Security. On the shield world, Tersa witnesses Enduring Bias watching a holographic demonstration of the Disassembler process. Bias' vague explanation causes Tersa to begin to doubt Ussa's intentions, as Enduring Bias unintentionally implied that Ussa wished to test the Disassembler process himself—even if it lead to the deaths of all Sangheili in the colony. As Tersa continues to work on the colony with 'Crolon and 'Drem, the two older Sangheili discuss their doubts in Ussa and the shield world. Bias informs the three that Sooln had helped reprogram some of his failing processes and that he was loyal to anyone that programmed him. After Bias learns that the San'Shyuum had connections to the Huragok from Sooln, Bias states that he would accept the presence of San'Shyuum on the world, as he believes that they would bring along Huragok to fully repair Bias. 'Crolon and 'Drem believe that Sooln and Ussa are actually conspiring with the San'Shyuum and began plotting against him. Later, while Tersa is eating, 'Crolon and 'Drem confront him and tell him that if he reports the two to Ussa for conspiracy, they will frame him as well. Meanwhile, Mken's dropship lands in the Reskolah region of Janjur Qom with the expedition members. Mleer, Trok, and Ziln wait at the dropship, while the rest of the team makes their way to the grotto of the Great Transition in search for the Luminary. After entering the grotto, the team discovers a Luminary and a device that holds a holographic projection of the Halo Array. However, a group of hostile Stoic warriors waits for the team outside the grotto. Suddenly, Vervum and Loquen betray Mken, Vil, and Floats Near Ceiling, and holds the three at gunpoint. Vervum demands that Mken hands over the Forerunner relics, but Vil wounds Loquen and the Huragok closes a door between them and the traitors. Before the door closes, Vil fires a shot into the distance to attract the attention of the Stoics. The Stoics attack Loquen and Vervum, and the latter is killed while Loquen is captured. After the Stoics leave, the survivors of the group return to the dropship and the rest of the team makes their way to the village of Crellum to retrieve the females. Meanwhile, Tersa becomes infatuated with Lnur 'Mol, a female Sangheili who is very combat competent. However, 'Crolon continues to insult Tersa and Tersa challenges him to a fight. However, Ernicka intervenes and orders the two back to work. Later, as Tersa and Lnur walk through the gardens on the shield world, they overhear 'Crolon and 'Drem attempting to convince Gmezza and Scorinn to rebel against Ussa with them. Tersa and Lnur are spotted by the group and 'Crolon and 'Drem give chase as the two young Sangheili attempt to run back to Ussa. After a brief fight with 'Drem, the two manage to escape. Later, Tersa, Lnur, 'Crolon, and 'Drem are on trial before Ussa. Enduring Bias plays holographic footage that shows 'Crolon and 'Drem conspiring against Ussa. 'Drem is killed and 'Crolon is arrested for his crimes. At Crellum on Janjur Qom, the dropship lands just outside the village and the group ventures in to locate the females. Soon, they meet Lilumna, the "leader" of the female San'Shyuum that wished to go to High Charity. The rest of the females arrive on top of a tamed ilpdor named Erb. The group attempts to return to the dropship, but they are attacked by Stoic forces and their folasteed mounts. The folasteed tear apart the captured Loquen in front of them. Erb charges at the Stoics and kills the rest of the warriors, but the animal itself is killed in the process. Eventually, the survivors and the females return to the dropship and leave to the orbiting Vengeful Vitality. As the corvette attempts to leave the system, the Stoics damage it with a missile. Parts of the ship begin breaking off and Mken chooses to save one of the female San'Shyuum, rather than the Luminary which burns up in orbit. Before Ussa can publicly execute him, 'Crolon escapes aboard Clan's Blade and captured by Covenant ships once he leaves the system. Meanwhile, Mken returns to High Charity with the females. He is brought before the Hierarchs, and with the help of Qurlom, he convinces them that he is not responsible for the destruction of the Luminary. Instead, R'Noh is demoted and his Ministry is dissolved. Qurlom also reveals that the interrogation of 'Crolon revealed the location of Ussa's new world. Commanding a fleet from the carrier Pledge of Holiness, Mken makes his way to the shield world. Mken communicates with Ussa and gives him an offer: if Ussa and Sooln turn themselves in, the rest of his allies will be free to go. Ussa declines the offer, knowing that his people would still likely be killed. Instead, Ussa warns Mken to extract his warriors off the world. Ussa has Enduring Bias activate the Disassembler process and the shield world is seemingly destroyed. Mken notices odd movements in the debris field, but chooses to ignore it, hoping that Ussa survived. As the fleet departs from the system, it is revealed that the Sangheili insurgents survived and they resettle in the former shield world's fragmented habitats. Ussa continues to lead the colony and hopes that his descendants will one day retake Sanghelios. Over 3400 years later, at the end of the 9th Age of Reclamation, Zo Resken, the Prophet of Clarity, compiles a record of the history of the Covenant. Zo is fascinated about ancient history and the writings of his ancestor, the Prophet of Inner Conviction. He is unusual among the San'Shyuum in his good relations with a number of high-ranked Sangheili, including Torg 'Gransamee and G'torik 'Klemmee. Zo Resken is appointed the Prophet of Truth's assistant and learns of the conspiracy among Truth and several other high-ranking Prophets—including the Prophet of Exquisite Devotion—to cast the Sangheili out of the Covenant. The story then follows Zo and his Sangheili allies as they experience the events that surround the Changing of the Guard, the Great Schism, the Battle of Installation 05 and the fall of High Charity. In the end, Resken and several Sangheili escape High Charity aboard the supply ship Journey's Sustenance as the Forerunner Dreadnought lifts off, headed for Earth. Journey's Sustenance eventually arrives in the Ussan system, which Zo Resken recognizes as the site of the standoff between Ussa 'Xellus and Mken—and the Ussans' subsequent act of supposed mass suicide. At Zo's insistence, the crew explore the system's asteroid belt for months in search of remnants of the Refuge colony while reports arrive of the developing situation with the Great Schism and the Arbiter Thel 'Vadam's newfound role as the leader of the Sangheili. Meanwhile, the descendants of the Ussans continue to inhabit the fragments of the Refuge, which are now in varying states of decay. Enduring Bias has been long inactive due to damage it sustained during the Disassembly process millennia earlier. The isolated colony's culture has changed significantly over this time and the key figures of Ussa 'Xellus' time have become legendary. The colony's integrity is threatened by a disease known as the Blood Sickness as well as the dissident 'Kinsa, who declares the Ussans should abandon the Refuge and seek out the now-mythical Sanghelios. After a civil war flares across the colony, the Refuge's kaidon, Bal'Tol 'Xellus, challenges 'Kinsa and his champions to a floatfight battle. Eventually, the crew of Journey's Sustenance discover the colony and gain access. Thanks to the presence of a Huragok, Sluggish Drifter, Enduring Bias is repaired along with some of the colony's critical systems. After Enduring Bias sides with the kaidon, most of the rebels lay down their arms and order is restored to the colony after the rest are suppressed. Enduring Bias develops a cure for the Blood Sickness and reconnects the disparate sections of the Refuge into a circular structure, facilitating easier travel within the colony. The Ussans return into contact with the rest of their species and those who wish to go to Sanghelios are allowed to do so, though Kaidon Bal'Tol and a number of others remain in the Refuge. Zo Resken also plans to stay and dedicate the rest of his life to studying the plentiful Forerunner artifacts and the Ussans' unique culture. In the epilogue, several of the Ussan Sangheili look upon the state of Zolam on Sanghelios, having returned to their ancestors' home at last. The title Broken Circle refers to the Refuge when in its disassembled state. 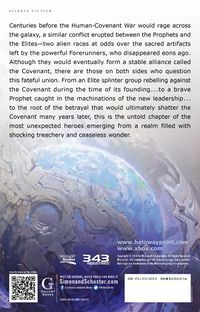 The novel's cover is illustrated by 343 Industries senior concept artist John Wallin Liberto, who previously created promotional and concept artwork for Halo 4 and Halo: Initiation.